Several projects are underway to renew New York State’s most popular state park. Terrapin Point, a popular spot in Niagara Falls overlooking Horseshoe Falls, reopened following a $4.4 million restoration. Improvements include new pathways, several new overlooks throughout the point, new railings, pavers, lighting, benches and new landscaping. A $5.6 million project to renew the Cave of the Winds Pedestrian Plaza and Stedman’s Bluff will also be completed this summer. These areas will be updated with improved dining areas, concessions, new restroom facilities and enhanced landscaping. Construction is also underway on a $7 million Cave of the Winds facility that will become a year-round tourism centerpiece of the park. 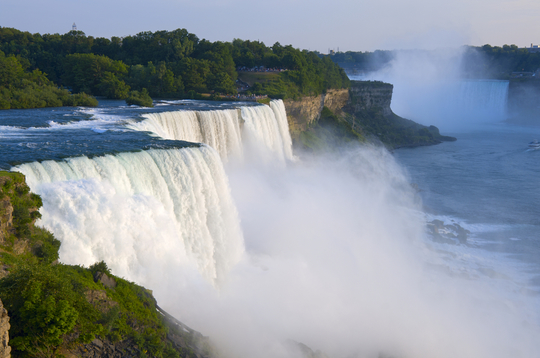 Instead of a long wait in line, the new attraction will allow visitors to enjoy a 30-minute interactive program featuring the natural and cultural history of Niagara Falls, before donning the customary rain poncho and sandals for the 175-foot Cave of the Winds elevator trip down to the Hurricane Deck. What better place to spend Fourth of July weekend with your family & friends than a New York State Historic Site! Several historic sites will be hosting events that are not to be missed. Visit Old Fort Niagara July 2nd through 4th for their three day reenactment of the French and Indian war, complete with artillery and engineering demonstrations. Knox's Headquarters and New Windsor Cantonment will celebrate the day with military drills, cannon firing and a reading of the Declaration of Independence. Or come experience an Old-Fashioned Independence Day at Clermont State Historic for 18th century crafts, reenactments, food, and fireworks! 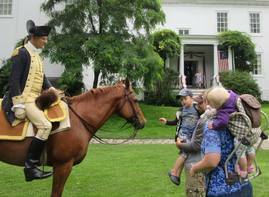 Enjoy an American celebration at John Jay Homestead State Historic Site with a fair, or check out Schuyler Mansion State Historic Site for games, performances, ice cream and an overall great time. For even more events and activities, please visit our calendar. 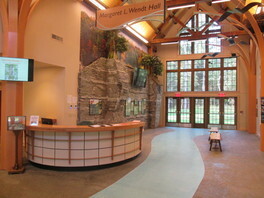 The new Humphrey Nature Center at Letchworth State Park is now open. The four-season facility will help visitors appreciate all there is to Letchworth State Park. 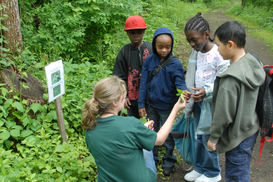 Visitors can learn about nature from birds to bugs, trees to trout, butterflies, deer, natural vegetation and its importance to the parks’ ecosystem; participate in guided walks and hikes; test their skills on a compass course; immerse themselves in a scavenger hunt to help solve nature riddles; and more. Governor Andrew M. Cuomo recently visited the Walkway Over the Hudson State Historic Park to announce that two new energy efficient gateway visitor centers will be built at both the east and west entrances to the unique linear park above the Hudson River. Both gateways will feature new services and modern facilities to make visits to the Walkway more enjoyable. On the Walkway’s east approach in Poughkeepsie, the visitor center will feature food vendors, open and covered outdoor seating, a dog friendly water fountain, bike racks, relocated signage, landscaping, and new restrooms. The westside visitor center in the Town of Lloyd will feature both open and covered outdoor seating and be powered by an array of solar panels. It will also provide space for food vendors, amphitheater seating for relaxing and special events, new and improved signage, enhanced landscaping, a bus drop-off location, and upgraded pathways. Construction on both facilities is expected to begin in 2017. Read more. See photos. As we kick off the summer, look for the following events across the state as great ways to stay healthy and active this season. 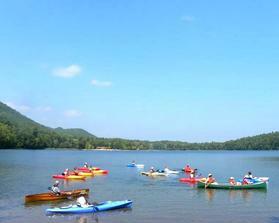 Interested in learning how to kayak? Join Tina, a certified kayak instructor, for basic beginner classes at Beaver Island State Park. Sessions will be held Thursday and Saturday throughout the summer. For more information call 716-282-5154. Space is limited so sign up early! Looking to get out on the trail this summer? Both Minnewaska State Park Preserve and the Sam’s Point Area of Minnewaska are providing numerous hikes and treks throughout the months of July and August. These include exploring the Shingle Gully Ice Caves at Sam’s Point and a trek to the rock slab beach of Lake Awosting. Hikes vary in length and difficulty so check the website or contact the park for more information. In addition to the hikes at Minnewaska, check out the First Saturday Hike at Robert Treman State Park on August 6th as you hike along portions of the Finger Lakes Trail, including the overlook of Lucifer Falls. For those interested in competition, Hamlin Beach State Park will host its Shoreline Half Marathon & 5K on July 16th and the Shoreline Duathlon & Triathlon on July 17h. Registration Info. , Grafton Lakes State Park will also host the Grafton Run for the Roses 5K, a 2.5 mile scenic nature walk or 1-mile kids run on August 14th. Registration info. Test out your dancing at one of two Long Island State Parks. Wildwood State Park will have square dancing every Friday night beginning July 8th from 7-8:30pm. In addition, Hither Hills State Park will have line dancing on Monday evenings beginning July 11th from 7-8:30pm. The Connect Kids to Parks Transportation Grant Program is available to Title 1 classrooms across the state to defray the costs of bus transportation to state parks and historic sites for field trips and connect New York State public school children with nature and state history. Grants will reimburse bus costs, tolls, the fee for bus entry into New York State parks, nature centers or historic sites, or a Department of Environmental Conservation (DEC) Environmental Education Center and any programs fees, up to $750. New York State is home to state parks with unique recreational opportunities, outdoor learning environments, and historic sites which bring New York history alive. The Grant program is for field trips in the 2016-17 school year. To learn more about this exciting program and to download an application, visit www.nysparks.com, email us at parksbusgrant@parks.ny.gov, or call 518-474-6736. 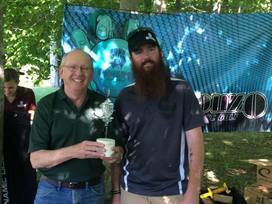 Darien Lake State Park manager Tom Rowland (left) was voted by disc golfers across Western and Central New York to be the first recipient of an award meant to recognize the hard work of an individual who supports the sport. This award was given to honor the contributions Tom has made as a partner to the sport of disc golf including his willingness to work with tournament directors and how that has translated into amazing events at the park’s Shore Winds Disc Golf Course. How long have you been volunteering at this location and how did you get involved? I have been involved for 6 years. 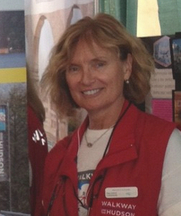 I started as one of the first Ambassadors when the Walkway volunteer program started – I love the bridge, the Hudson Valley, and wanted to give back to the community. Describe a recent project, program or initiative that you organized or participated in: I have been involved in many of the Walkway projects from designing and implementing the Walkway’s Mobile Web Tour in partnership with Marist College and IBM, helping to create the Walkway’s new web portal development again in partnership with Marist College, and leading the Green Team for the Walkway Marathon which became the first certified green marathon in NYS. I currently am on the Board of Directors and chair the Walkway Program and Community Outreach Committee. Is there anything else you’d like to add? Being a Walkway Ambassador Volunteer is a wonderful opportunity to be involved in the community and help others experience the Walkway and the greater Hudson Valley. At the same time, I get to meet local, state, and international visitors while, hopefully, helping to make our area a great place to live and visit. How long have you been with the agency? I started in 1992, but I also worked at Crailo before graduate school in 1986 & 87. What does someone in your position do? 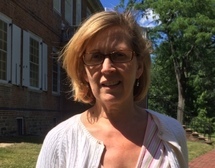 As Historic Site Manager of Crailo and Schuyler Mansion State Historic Sites, I am part of a great team of employees who share fascinating stories with the public! These stories are often unexpected discoveries for visitors as they find that our nation’s important history happened right in their own neighborhoods. What inspired you to work in the park system? Probably finding a musket ball during an archaeological project at Crown Point when I was 9! My family camped throughout the Adirondacks frequently and in Florida regularly and we visited parks and museums all along the way. My parents instilled the love of wonder and wanderlust from a very young age and there is always something new to discover! What’s the coolest thing you’ve ever done through your position? In 2013, Crailo staff members were invited to the Yale Public History Institute with the Gilder Lehrman Center for the Study of Slavery, Resistance and Abolition. While there, we were to research and workshop the beginnings of an exhibit on slavery under the Dutch in the 17th century with the help from experts from Yale University, The Smithsonian Museum of African American History and Culture, and many experts on slavery in America. It was the most enriching experience of my entire work life, let alone this agency! And it resulted in the current exhibition, A Dishonorable Trade: Human Trafficking in the Dutch Atlantic World which is receiving international attention. Is there a destination in the park system you’d recommend to someone? Well of course I would recommend both Crailo, the museum of the Colonial Dutch in the Hudson River Valley, and Schuyler Mansion, the 1760s Georgian Mansion of Major General Philip Schuyler and Catharine van Rensselaer Schuyler. In addition to encountering the rich history at these sites, you will be welcomed by friendly, engaged employees who are genuinely interested in the stories they share!